Lancashire retain an outside chance of a third successive victory at Wantage Road, after they took two Northamptonshire wickets on the third day of their LV= County Championship match. The Division Two leaders are ahead by nine, with the home side 42 for 2 in the second innings after Lancashire were dismissed for 436. Overnight rain saw play start two hours later than scheduled, with Lancashire resuming on 216 for 4. Given the choice, both sides may not have bothered with a swirling and unremitting gale that necessitated the removal of the bails for virtually the whole day’s play. Such was its power that at one stage, the umpires had to make sure the uncovered stumps stayed in the ground. Rory Kleinveldt - who wore a beanie hat underneath his cap for extra warmth in the field - drew the short straw of bowling into the wind from the Indoor School End. But the powerful South African extracted bounce when Alex Davies chipped the catch to midwicket, after adding just four to his overnight score. Jordan Clark negotiated four balls before edging Kleinveldt behind to Adam Rossington without scoring and in the space of the first 15 minutes of play, the Division Two leaders were 221 for 6 and still 164 behind. But Ashwell Prince who was 104 not out overnight, found support from Peter Siddle who batted sensibly while he and the 37 year-old added exactly 100 for the seventh wicket. 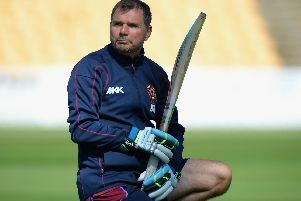 The Australian who had been ill 24 hours earlier, looked the picture of health at the crease, punishing anything loose by the Northamptonshire attack. Prince was also reassuring with his off-side drives a constant source of anguish for the home seam attack, one such stroke off Steven Crook bringing up his 150 off 268 balls. But when Crook induced Prince to pop up to substitute David Murphy, it ended a run of 13 hours and 24 minutes’ undefeated batting against Northants. Alex Wakely’s side could be forgiven for relief after enduring Prince’s career-best 257 not out in last year’s innings defeat at Old Trafford. Siddle returns home after Lancashire’s next Championship game against Gloucestershire but the Victorian delivered for his employers here, reaching his 50 off 95 balls. But before visions of only a second first-class century became reality, he was lbw to Kleinveldt for 89, the fifth wicket for the South African and his first five wicket haul in Northamptonshire colours.